A cookbook with great salads has a good shot at winning me over and this is a great salad. I rarely eat dates or use them in anything and now I’m wondering why. Where have you been all my life you sticky little gems? Their pleasant chewiness is a nice contrast to the other crunchy ingredients here and they are sweet without hitting you over the head with it. The raw onions were surprisingly mild, due, no doubt, to the fact that they marinate briefly in vinegar (along with the dates). And how can you not love pieces of pita bread and almonds sauteed in butter? Unfortunately I was not able to find sumac at the regular grocery store and, frankly, was not entirely sure what I was looking for. Did I look like a complete idiot standing in the spice aisle when, in fact, it’s some kind of tuber? Or aperitif? Luckily, the kids at the store were even more clueless than I was so I left with my dignity in tact. For a change. So without time to search other stores or order online I had to omit the sumac. Luckily, they have it at one of my favorite places on earth (conveniently located close to my office), The Spice House. Assuming there are some people reading this blog who don’t work at my office, you can order it online! And if you’re going to buy this book you might as well stock up now because you’re going to need it. The only thing I will do differently when I make this again (aside from the sumac) is to give the pita a few minutes head start on the almonds when I saute them. My almonds were getting dangerously close to burnt and I would have liked to give the pita a few more minutes on the stove. 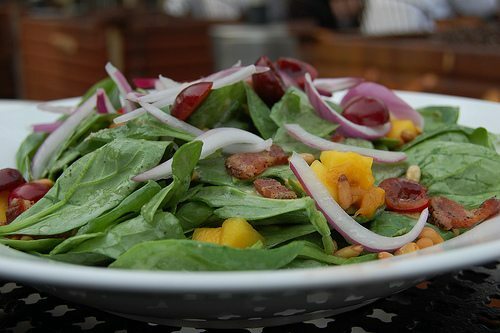 Baby Spinach Salad with Dates and Almonds is on page 30 of Jerusalm and right here courtesy of the New York Times. I caved and bought Jerusalem and I am looking forward to cooking from it, starting with the date and almond salad. I found sumac cheapest at myspicehouse.com which offers free shipping with $10.00 purchase and is now offering an additional 10% off. I’ve been as happy with the spices (e.g., Grains of Paradise) I’ve bought from them as those I have bought from Penzeys.